It would take a visitor more than 33 days to view every panel—spending only 1 minute at each panel. The AIDS Memorial Quilt Digital Experiences were created in collaboration with Dale MacDonald from Onomy Labs, Julie Rhoad and Roddy Williams from the NAMES Project Foundation, Jon Winet and his team from the University of Iowa’s Digital Studio for Public Humanities (DSPH), and Andy VanDam and his LADS team at Brown University. 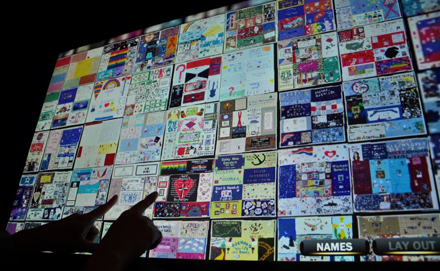 The aim of this project was to design a digital memorial using appropriate technologies that would augment the experience of viewing the AIDS Memorial Quilt. Created by the Public Interactives Research Team (PIRT) at USC, the work was supported by grants from the National Endowment for the Humanities Digital Humanities Office, Microsoft Research, and the USC Fund for Interdisciplinary Research. The experiences were exhibited as part of the 2012 Smithsonian Folklife Festival in Washington, DC. Many scholars and activists contest these “official histories” for the homophobic bias that sneaks into descriptions and accounts. For example, these official histories often refer to people who are infected with HIV as “AIDS patients” or even “AIDS victims.” These labels do not represent the identity of those who are living with HIV. The identity of “patient” is meaningful only from the point of view of a medical system. The term “victim” implies a state of powerlessness.The AIDS Quilt Touch Timeline enabled USC docents during the Smithsonian Folklife Festival to talk with visitors about the broader social, political, and bio-medical events that are part of the multi-faceted history of AIDS and the Quilt in the United States. There, the docents were especially interested in taking into account the critiques of the way in which AIDS/HIV have been “narrativized” in the “official histories” of the epidemic. In effect, the team created counter-narratives that displaced the figure of the “hero scientist” and the process of “science as discovery.” While we noted the specific medical researchers who were involved in identifying HIV, we contextualized these accounts by including key episodes that highlighted critical acts of intervention — when activists confronted government officials and protested official policies. The story about the history of AIDS/HIV that is not told enough, we believe, is the account of how the practice of medical science was actually transformed by the work of activists during the early days of the epidemic. Remember that it was the work of an activist, not a government official or medical researcher, that prompted the RED CROSS to finally understand that its ENTIRE national blood supply needed to be screened in order to prevent transmission of HIV.